Typhoon Mangkhut is lashing China’s most populous province, bringing winds of up to 100 mph (162 kph). Guangdong is on its highest alert for the storm, which also hit Hong Kong, where it swayed skyscrapers and blew out windows. The death toll from the Philippines meanwhile jumped from 30 to 49 – most of them killed in landslides caused by heavy rain. What’s the impact in China? Typhoon Mangkhut made landfall on the Chinese coast near Jiangmen city on Sunday afternoon local time, state media reported. Thousands of people have been evacuated from Guangdong, and authorities there issued their highest warning level, a red alert. 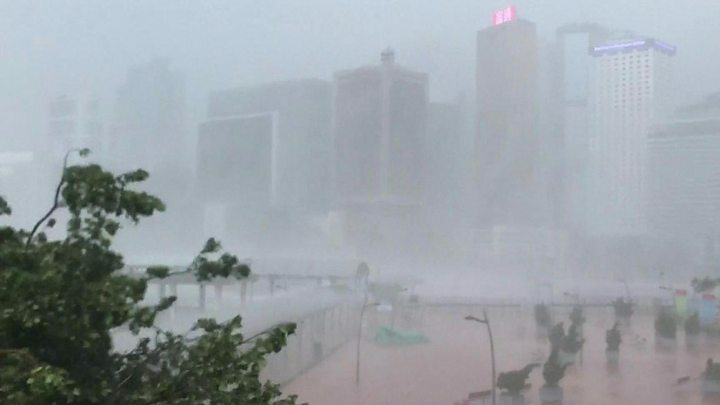 In Hong Kong, authorities also issued their maximum alert, with residents warned to stay indoors to avoid flying debris. Winds there reportedly reached more than 110 mph (177 kph). Officials put the number of injured at 111 but the territory avoided a direct hit. Not everyone paid attention to the warnings, though. “I went running this morning. I love fresh air and there’s no one on the streets, no cars. On normal days we can’t see this,” Hong Kong resident Hao Chen told the AFP news agency. In neighbouring Macau, for the first time in its history the territory’s famous casinos were ordered to close. Mangkhut is expected to weaken into a tropical depression by Tuesday as it moves inland. 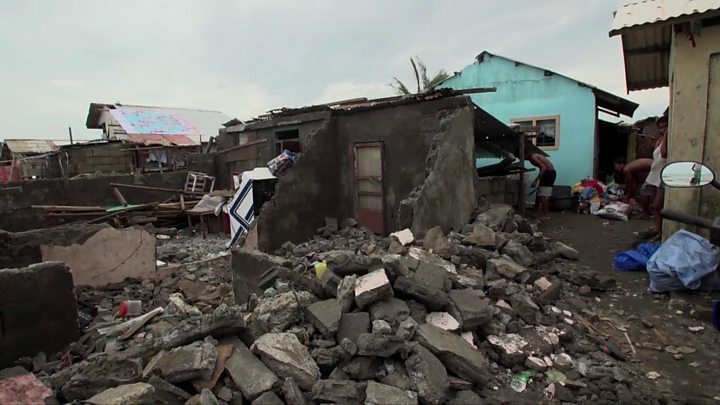 How badly has the Philippines been hit? A local military official told Reuters news agency that 19 people were killed in landslides in one part of Benguet province. There are fears they were part of a larger group of 43, possibly miners, still trapped in an old mining bunkhouse engulfed in rubble in the town of Itogon. Preparation and evacuation procedures have improved since Super Typhoon Haiyan in 2013 which killed more than 7,000 people. Warnings were issued, travel was restricted, schools shut and the army was put on standby in advance. How have you been affected by the typhoon? Email [email protected].